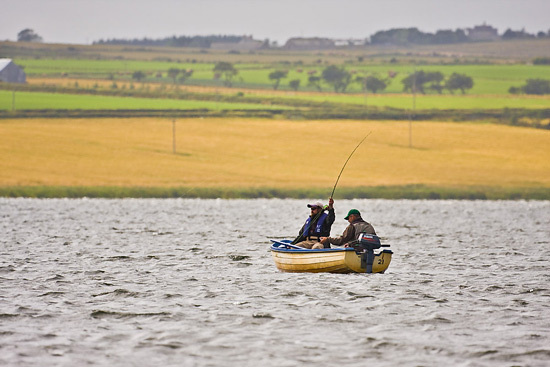 The county of Caithness is home to over 100 trout lochs. Most of the Caithness is low lying and relatively flat, but from a topographic and fishing perspective there are 2 contrasting environments. To the west and to the south is the ‘Flow Country’ a large expanse of flat blanket bog scattered with peatland lochs. To the east and north, lies fertile gently rolling farmland overlying soft limestone marls. This creates extremely productive lochs rich in weed growth and invertebrates, including Loch Watten, Toftingall and St John’s. That does not mean that the peatland lochs should be ignored. 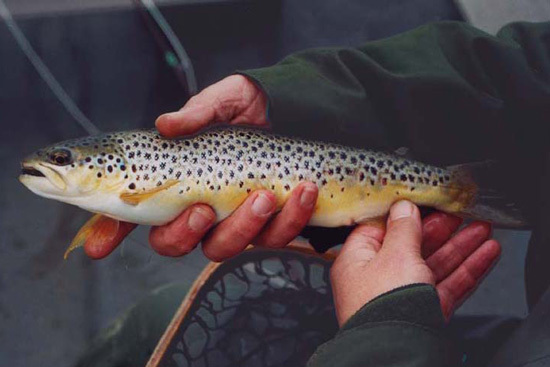 The scenery and wildlife are unique, and although the average size of the fish is often smaller, the trout are there in great numbers, and there are also lochs with stocks of larger fish. The marl lochs can become discoloured after high winds, so Loch Calder, the Ulbster lochs and the Thrumster lochs to the south of Wick are worth keeping in mind for these conditions. Many of these lochs also offer good bank fishing, a useful option in wild weather. 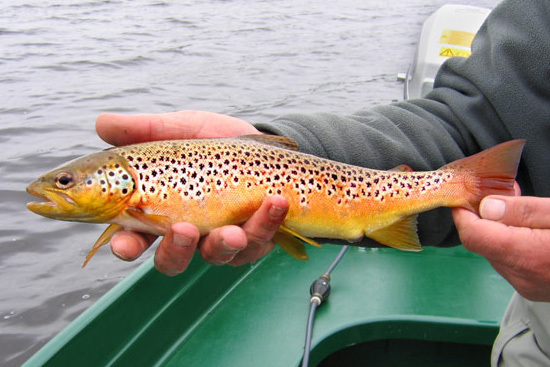 With so many lochs to choose from, Caithness makes a great excursion destination for trout anglers, though it can equally fill a week or longer fishing holiday. Loch Watten is the second largest loch in Caithness, almost 3 miles (4.65 km) in length running north-east to south-west, with a surface area of approximately 370 ha (914 acres). 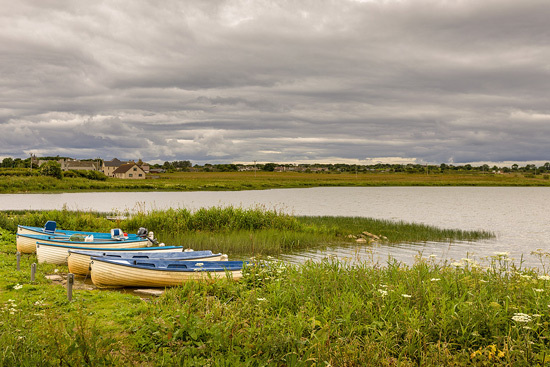 Watten is a marl loch, lying just 17m above sea level with an average depth of 10-12 ft (2.5 – 3m), which means that the water tends to stay clearer after prolonged big winds than on some of the shallower lochs. Described by local angler and author Neil MacDonald as the 'Jewel in the Crown of Caithness lochs', this is loch fishing at its best, though sometimes a lot of perseverance is required until there’s a hatch and the fish magically ‘come on’. 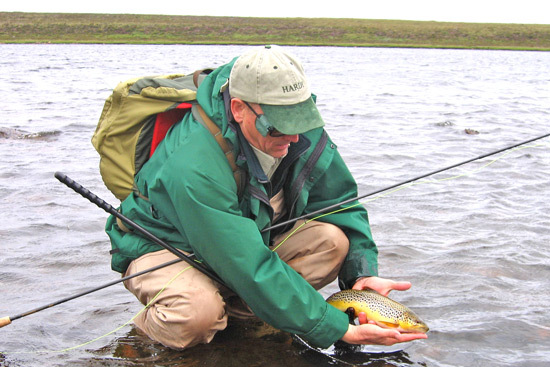 Traditional 'loch style' and modern dry fly and nymph tactics can be equally effective depending on the wind/wave state. The wild brown trout are beautifully marked averaging just under a pound, with plenty of fish in the 2 to 3 pounds class caught annually. The season is short, running from May 1st to September 30th only. Slightly larger than Watten at approximately 384 ha (950 acres), Loch Calder is quite different, much deeper, at up to 28m (85 ft) and bordered on the west side by moorland with large exposed flagstone beaches and shallow bays. 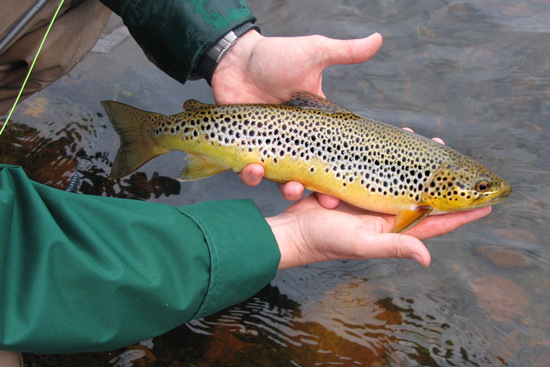 There are large numbers of obliging trout in the ½ to ¾ lbs range, and some much larger trout. The loch also has Arctic char and hence ferox trout, and occasional fish of up to 6 lbs are caught on the fly. A beautiful loch, good accessible bank fishing, particularly on the east and north banks, and fishing is also permitted on Sundays, so this can be a useful option, particularly when blown off other lochs. St John's is a shallow marl loch, typically only 5-6 ft (1.5 to 2m) in depth, lying at 25m above sea level. Because of its shallow nature and marl bottom, it can be affected by heavy weed growth in the summer and discolours easily in periods of high winds. 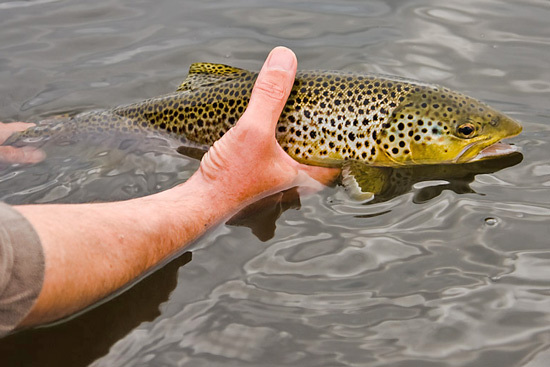 The trout average 1 lb, with several fish of over 3 lbs caught annually. 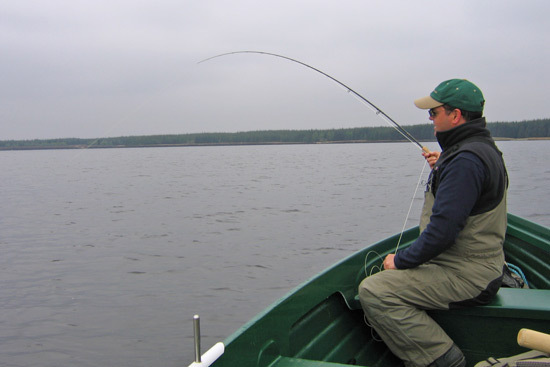 The prime fishing is in late May through until to the end of June when there can be prolific mayfly hatches. Bank fishing is allowed and can be productive, especially early in the season. Even shallower than St. John's at only 4-5 ft (less than 1.5 m), Loch Heilen is another sizeable marl loch of approximately 78 ha (191 acres). Plagued by prolific weed growth in the summer, discoloured water in periods of high winds, and generally dour, this loch is still worth a visit for the experienced angler as it is a renowned big fish water. Be prepared to blank, and you could be pleasantly surprised. Toftingall is another shallow marl loch of 50 ha (124 acres) in an interesting and secluded setting surrounded on all sides by forestry plantation. Beautifully marked and varied brownies averaging about ¾ lb. Excellent. A dozen or so small trout lochs lying in the peatlands, though often with adjacent forestry plantation, owned by the Ulbster Estate. Great wilderness, 180 degrees of sky, well worth visiting. Most of the trout will be ½ to ¾ lbs, but many of these lochs have stocks of larger fish. A good loch to get your confidence back if the fishing's been tough elsewhere. A good head of trout in the ½ lb to 1 lb range, generally obliging. Excellent bank fishing and fishable in all conditions. 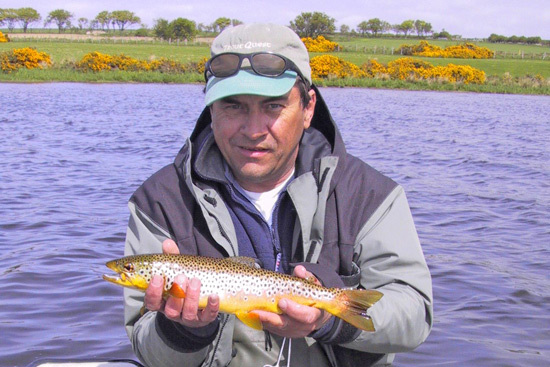 Follow TroutQuest's board showcasing trout fishing in Caithness.